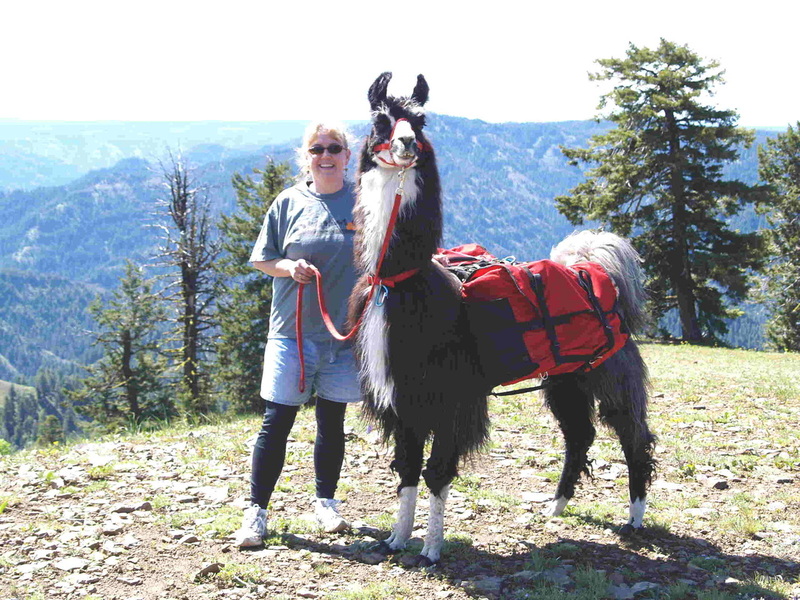 JNK Llamas has been an authorized dealer of Flaming Star Llama Packs and Products since 1997. We are the only part of the business that has been with the business through three different owners. Excellent care is taken in constructing Flaming Star Llama Equipment. They are made of high quality cordura and pack cloth with heavy-duty double stitching. All components are selected for durability, strength and weather resistance. Complete pack systems include panniers, a saddle, top loading straps, a girth strap, a chest plate, and a set of cinches. They truly are one of the finest llama packing systems on the market. They are easy to load, adjust and they fit the llamas like a glove when fitted correctly! By ordering them from us, you receive our great customer service and after purchase follow up! If you would like more information or have questions about them, please CONTACT us. JNK does stand behind ALL llama pack equipment and llama packs sold. ***At times we have used systems in stock. Contact us for details and specifics on availability. To place an order please call 360-592-2603 or CONTACT us. Star pack systems and recommends them to her clients. Listed below are the prices and descriptions of the various llama packs available through Flaming Star. Orders can be drop shipped directly to customers for an additional fee. For the accessories list available through Flaming Star, click HERE. If you have any questions please CONTACT us. We use Flaming Star Llama Packs for packing, 4H and the showring. *Note: Saddle weight is included in total weight. computing the overall volume of the pack. are all complete pack systems. a chest plate and a set of 2 mohair blend cinches. Click HERE to see pack comparisons chart. The Maverick Llama Pack is a hybrid of the discontinued Master Pack and the current Wrangler Llama Pack. It has the top pocket of the Master Pack, and the side pockets of the Wrangler. It is the most versatile pannier system available! The top pocket can be used as a training pack or day pack with the main pannier body rolled under and secured with the attached straps. Or, as part of the full-size pack, it can hold sleeping bags or other lightweight gear. It is two packing systems rolled into one! The Maverick Pack comes with a saddle, two detachable panniers, two mohair blend cinches (one 18" and one 16"), a chest plate, a belly strap, and a pair of top load straps. Complete Llama Pack System: $510. Panniers only: $320. The side pockets are now 2" wider than the other models and have a flat bottom. Nalgene bottles will fit side pockets easily even when using square buckets in the main compartment. One zippered pocket and one open pocket with an elastic drawcord are on each pannier. Complete Llama Pack System: $410. Panniers only: $220. Offers the same large cargo pockets with draw-string weather guard as the Master-Pack. Top loaded long or odd shaped objects can easily be handled with Deluxe-Packs. A horizontal compression strap helps tighten the load, and vertical compression straps close the top flap while lifting up the bottom of the panniers. It is the red pack pictured at the top of this page. Complete Llama Pack System: $385. Panniers only: $195. Designed as an economical version of the Deluxe-Pack with the protective draw-string weather guard and one open pocket on each pannier. Complete Llama Pack System: $360. Panniers only: $170. This is a complete llama pack system with it's own saddle. Each pannier has a draw-string weather guard in the main compartment, one open pocket and will detach quickly from the light weight padded saddle. The Trail-Boss functions well to fit a young pack llama and get him started with a system. It is great for day hikes, 4-H, ALSA/ILR llama & alpaca performance shows and parades. Rated for 40lbs or less. Picture at left shows saddle and Chest Strap for all systems except the Trail Boss. (For Chest Strap or other accessory prices, see Flaming Star Accessories Page). This saddle is available in Black and Colors. *Each saddle includes a chest plate and a set of mohair cinches. Each pannier set includes 2 top loading straps and a girth strap. *Shipping and handling apply for all orders for US customers. * Charges are different for Canadian, Alaskan and European orders. *Sales tax applies to Washington residents. *All styles are subject to change without notice.